Way before everyone starting touting the pomegranate as the latest miracle wonder food, I was already an old pro at this tart and refreshing fruit. Back in grade six, my mom kept me in fine pomegranate style. I was smitten with the Go-Go’s and smitten with the pom. I only ate tart fruit and my mom figured I needed variety away from the white grapefruits I would normally would eat during the winter, so she introduced pomegranates to my lunchtime routine and I was instantly hooked. I liked that I could eat them slowly, juicy kernal by juicy kernal and share them eagerly with my friends. Now that I’m all grown up, I still enjoy the pom in salads, with yogurt and granola or just plain, kernal by kernal. Tonight, when figuring out dinner options, I knew that I had some fresh shrimp to use up along with some near-wilty romaine lettuce. Upon closer fridge inspection, I found some oranges, limes, celery, a green pepper, a quarter of a white onion and the miracle pomegranate. Well, it looked like I had the makings of a perfect salad and I wasn’t wrong at all. I decided to spice up the shrimps with chipotle powder and brighten them up in some lime and orange juice, zest and all. The salad did require some time in the kitchen…no one said prepping a pomegranate was quick! But the time spent peeling and picking was well worth it. Cornelius pronounced this meal amazing and I was too busy licking my plate to pay attention. Yes, it was that good. Perfectly light, bright and colourful. It’s like summer on a plate at the beginning of January! 1. Rinse the shrimp and place in a medium sized bowl. Pour lime and orange juice over shrimp, along with the zest and chipotle powder. Toss and set aside. I just left these on the counter to marinate for about an hour. I live to write this now. 2. Prepare the pomegranate* and put the kernals into a medium sized bowl, along with the diced orange, onion, green pepper and celery. Toss with the juice of the orange and lime and their respective zest. Set aside for 30 minutes. Knit, call your mom or read a magazine. 3. After the 30 minutes have passed, make the dressing by combining the dressing ingredients along with the juices from the bottom of the bowl in Step 2. I just used a spoon to scoop up the fruit-juicy goodness. 5. In a large cast iron pan, melt butter and add the shrimp in one by one into one layer. Don’t pile them in. When you’ve added your last shrimp, the first shrimp you added should be ready to turn over. Use tongs and gently turn over the remaining shrimp. Remove from pan immediately as you don’t want the shrimp to overcook. 6. Tear romaine into bite sized bits and place into a large salad bowl. Put the orange/pom/veg mixture from Step 2 on top of the lettuce and then pour the dressing over top. Toss and plate. 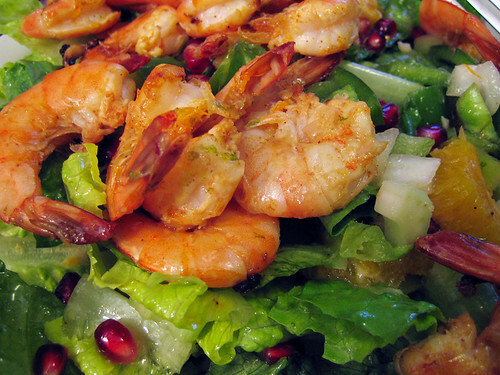 Divide the shrimp and place on top of the salad. Let the ooohs & aaaahhhhs begin! This makes 4 appetizer sized plates or 2 large meals. * Don’t know how to prepare a pomegranate? It’s easy but time-consuming. Have one bowl ready for the delicious seeds and have another bowl handy for the compost. An apron to cover your clothing would also be a good idea, as pom juice stains. First cut off the top until you see seeds. Then, tear into that sucker and start de-seeding. It should break into a couple different parts. Choose only the brightest seeds. If they look cloudy or plummy, toss them into the compost heap. It has never occured to me to use chipotle spice on shrimp before, but that is a flavour sensation I would absolutely love ! Being of Greek descent, I too, grew up with the pomegranate in the household. I would eat it seed by seed on its own, savouring each burst of tart juice. In fact, whenever my mom makes her yearly trip to Greece she always brings back a few pom’s tucked away in her suitcase. Surpringly, Customs has never questioned her about them. Hi there! I love pomegranates too and just learned of a super fast way to harvest the seeds. Cut the pomegranate into halves,pick off any membrane that is in the way, put on an apron, and start wacking the skin side with a wooden spoon. The kernals just fall out! Looking forward to trying out your recipe. I recently prepped a pomegranate this way and it worked really, really well. I think the advantage of the water method is: less chance of staining everything in sight with delicious red juice. maven, that is too much work for me! i actually didn’t stain anything cuz i’m all pro-like 😉 but thanks for the tip. joanne, chipotle and shrimp are a nice match! yum! michelle, i like your way! getting your ya-ya’s out with a wooden spoon on a pomegranate sounds like just the thing for this monday night! OH this sounds great and I never thought about adding something hot and spicy to pomegranate! OOh interesting! I’ve never my salad with pomegranate before, but I think I’m just gonna start doing it from now own. Thanks! I really liked them, but never thought about what else I could do with them…. With all the shrimp lovers in this house, I’m going to have to give this one a try. I think my little girl will really enjoy them! jenn, you must have missed how i cracked open the pomegranate! meena, pomegrantes go great in salads! i used to make one with lettuce, feta, apples and pom. yum! scott, i hope this works out for you! my husband couldn’t stop raving. it really was delicious! just found your blog, it’s wonderful and i have a pom in my fridge waiting to be eaten, i think we’re having salads for dinner tonight!